I read this article and found it very interesting, thought it might be something for you. The article is called #Notebandi Frontlines: Small Stores Struggle To Survive, But Many Support Modi and is located at https://archive.indiaspend.com/cover-story/notebandi-frontlines-small-stores-struggle-to-survive-but-many-support-modi-17982. Ambika Kumbhar (62) with her daughter-in-law Manisha (34) at their kirana store off the Bhiwandi-Wada road in Thane district, north of Mumbai. The Kumbhars reported a 62% drop in earnings since demonetisation, IndiaSpend found in a survey of mom-and-pop stores in and around the financial capital. Mumbai: At noon, cars sped along the Bhiwandi-Wada road in Thane district, north of India’s commercial capital, past ‘Shree Swami Samarth’, a 100-square-foot shop selling cold drinks, fried snacks, pots and general provisions. Inside the three-walled pile of asbestos sheets, bricks and iron, 62-year-old Ambika Kumbhar, the store’s owner, sat next to a plastic cash box, alert, watching the trucks and cars hurtle by, hoping they would stop, as often as they once did. About a year ago, Kumbhar’s family, with savings of less than Rs 4,000, cobbled together this shop, sized slightly larger than two ping-pong tables, off Maharashtra state highway 35. The Kumbhars are traditionally potters, set on the lowest rung of the Maharashtrian Hindu caste order. When they worked with clay, fired it in brick kilns moulding bricks and pots, on good days, the family of seven earned between Rs 150 and Rs 200. When they made the transition to shop keepers–as many millions moving off farms tend to do–the family’s income steadied, bringing in Rs 700 to Rs 800 a week. That was until November 8, 2016, when the government scrapped Rs 1,000 and Rs 500 notes,­ pulling out of circulation 86% of India’s bank notes, by value, or Rs 14.8 lakh crore ($217 billion). There are about 12 million to 14 million kirana shops—family-run corner-shops/mom-and-pop or convenience stores selling groceries and other products—across India (according to this 2015 report by PricewaterhouseCoopers, a consultancy, with India Retail Forum), and they are vulnerable to losses from ‘notebandi’—as demonetisation is called colloquially. A population, roughly speaking, equivalent to that of France or Thailand, depends on these stores for a living. Prime Minister Narendra Modi, in an address to the nation six days after the original notebandi announcement, requested 50 days (up to December 30, 2016) to restore normalcy. Nearly 80% of all respondents reported losses between 50% and 60% or greater. Less than 38% of all stores–predominantly located in urban areas–have adapted to point-of-sale (PoS) machines or mobile-wallets, while kirana shops in rural parts still depend only on cash. Half of those we surveyed supported notebandi, while a greater proportion (58%) continues to view Modi favourably. 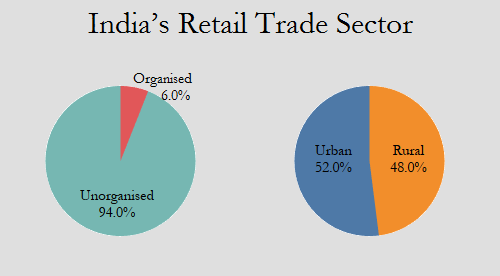 The retail trade has been one of India’s economic and employment bright spots, and Mumbai is its hub. The Mumbai metropolitan region is home to 18.3 million people, the world’s sixth largest urban agglomeration, according to this 2016 Demographia World Urban Areas report. These 18.3 million make up no more than 1.5% of India’s 1.2 billion people, but they account for almost a third (29%) of India’s retail spending, followed by the National Capital Region (25%) and Bengaluru (15%), according to this 2015 report by international property consultants Knight Frank with the Retailers Association of India. India’s retail market is presently over $600 billion. Expanding at a compound annual growth rate of 5.8%, it is regarded as the “world’s fastest growing major developing retail market”, ranking 15 on the Global Retail Development Index, in this 2015 A T Kearney, an international management consultancy, report. The retail sector employs 8%, or 35 million Indians, and is the country’s third largest source of employment after agriculture and construction, with deep penetration into rural India, said this 2013 Planning Commission report. It contributes to about 15% of the gross domestic product and unorganised kirana stores comprise 94% of the industry. Food and groceries occupy more than half the sector, according to this 2014 Deloitte study. The Mumbai metropolitan region also has the highest potential for modern retail in India, with its reach predicted to increase to 50% (presently 13.5%) of the population by 2036, particularly for daily-needs supermarkets, Knight Frank said. In conversations with kirana store owners in Maharashtra’s Konkan division, IndiaSpend found nearly 80% of all respondents reporting a loss of between 50% and 60% or greater. All stores across Mumbai, Thane and Palghar districts reported losses of at least 10% since notebandi. ‘Business is now slowly recovering’ was the conclusion of 60% of respondents in Mumbai district and its peripheral areas of Ghodbunder and Mira-Bhayander of Thane district. As many as 75% of respondents in the semi-urban and peri-urban areas between Virar and Vasai in Palghar district said there was no significant improvement. Kirana shops we visited in the rural areas of Thane and Palghar districts said business had fallen after notebandi and has been sluggish ever since. Store-owners across the board identified tendering change to customers for the new Rs 2,000 notes as their primary hurdle post-notebandi. “I’m forced to buy more goods from suppliers as they refuse to return change, but how do I treat my customers the same way when they are daily wage labourers?” said 30-year-old Lalita Patil whose family owns a two-year-old corner shop in near an adivasi (tribal) settlement in Vaghavali village, near Kawad, Bhiwandi district. "I'm forced to buy more goods as suppliers refuse to return change. Can't treat my customers the same as they're daily wage labourers." We storified our tweets from IndiaSpend’s visit to kirana stores. You can read them all here. With no other means to do business, all shopkeepers said they were still extending credit lines to regular customers, affecting their own ability to tide over the initial distress caused by notebandi. “I’ve been giving goods on credit to the entire village for over two months now–either they don’t have cash or we don’t have money to return as change,” said Kamlakar Patil (42), a convenience store owner in Dugad village; he reported 50% losses since November 9, 2016. Responding to the government’s call to go cashless, in urban and semi-urban areas, 8% of shopkeepers admitted to accepting cheques, only from regular customers. Nearly 17% said they now used PoS machines in their stores, while 21% said they had or will apply to banks for the device. Of the 20% of stores that have opened mobile-wallets, all reported that customers were reluctant to use them. “I opened a mobile-wallet account, the balance is still zero, as nobody has asked to use it for payments,” said Thanaram Chaudhari (42), whose store in Ghodbunder, Thane, suffered 55-60% losses since notebandi began. #NoteBandi hasn't caused too much difficulty but extra charges on cashless transactions are eating our profits. Prefer cash sales any day. A month after scrapping Rs 1,000 and 500 notes, union finance minister Arun Jaitley announced debit and credit card transactions up to Rs 2,000 would be exempt from the levy of service tax, said this December 2016 report in The Hindu. 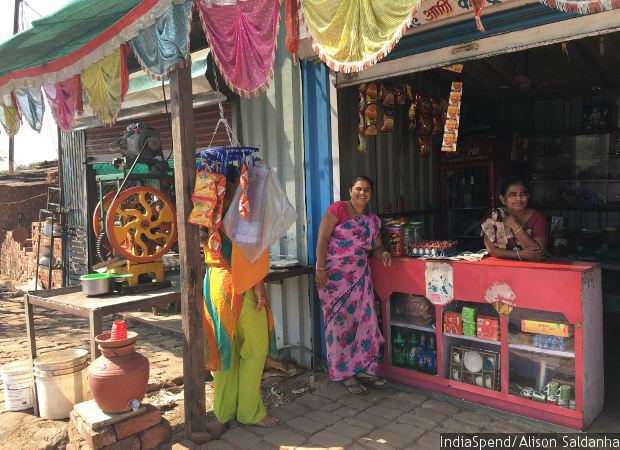 In rural Thane and Palghar, IndiaSpend found that none of the kirana store owners surveyed owned or intended to own a PoS device or mobile wallet. In 50% of the interviews, respondents had never heard of these cashless modes. After being told how these worked, kirana owners dismissed the technology. Among all store owners interviewed, we found nearly 60% shared the same view: That either their stores were too small and the purchases made of too little value for mobile wallets and PoS machines, or their customers, like the store-owners, were not educated enough to go cashless–or both. All 24 respondents further admitted that while, over the past few years, mom-and-pop stores were already losing significant business to modern retail shops, such as supermarket chains, the trend has accelerated since notebandi. Does organised retail = going cashless? By 2020, India’s retail market is expected to more than double its current size to reach $1.3 trillion, according to the 2015 A T Kearney report. “Consumer and investor sentiment have seen an uptick, as the pro-reform government under Narendra Modi sets out on an ambitious goal of improving its Ease of Doing Business ranking from 142nd to 50th in the next two years,” it said, describing India’s retail market to be on “the cusp of a strong growth phase”. Organised retail means trading activities that are undertaken by licensed retailers who pay taxes, whether sales tax, income tax, VAT, and now, the goods and services tax (GST). Unorganised retailing, on the other hand, refers to the traditional formats of low-cost retailing–for example, the family-run kirana store, paan/beedi shops, convenience stores, hand cart and pavement vendors, who do not issue any or proper receipts for transactions and do not pay taxes. A mainstay of India’s retail trade for centuries, these small shops are more sources of livelihood and a refuge for the educated unemployed and underemployed, said this 2014 research paper from Pondicherry University. They are rarely larger than 500 sq ft, their costs are low and margins slender, they pay few taxes and know their customers, said the study. The GST could change this, said a financial-inclusion expert, requesting anonymity, from an international private foundation, which also funds an Indian digital-inclusion programme, if the supply chain is encouraged to do away with informal receipts. Currently, 17%–or, 204 million Indians–use smartphones, of which no more than 54% (110 million) use their phones for digital purchases, according to the 2015 PWC report. “Receiving payments digitally may be in their (kirana stores’) favour, as it will allow them to get access to formal credit; banks don’t appear keen to lend to them in the absence of any transaction details or in the absence of documented business accounts, which could highlight their ability to repay loans,” said the expert. Traditionally, small traders and family-run kirana stores form a core vote-bank for Modi’s Bharatiya Janata Party (BJP). In 2006, India opened the single-brand retail sector to foreign investment up to 51%. While it removed this cap in 2012, a 51% limit on foreign investment in multi-brand retail endures as the BJP believes such a move would hurt small, independent stores, said this Economic Times report from September 2016. Signalling a change in one of the party’s key stances, PM Modi, in the run-up to the 2014 Lok Sabha elections, said small traders must embrace technology and create virtual malls. “If books are available online, then there is little reason for anyone to visit a shop,” Modi said, quoted in February 2014 in Mint. Although notebandi has brought adversity, half the shopkeepers we surveyed across urban, semi-urban and rural areas expressed their support for demonetisation. They believed their hardship was a by-product of “punishing the guilty rich”, a sacrifice for the good for the nation. “We poor anyway go through so much suffering regularly, so we can brave a little more trouble if the rich are also forced to pay,” said Patil, the Dugad village store owner. Sunny Patkar (27), a convenience store owner in Vajreshwari town of Bhiwandi taluka, hopes that apart from solving the black money issue, notebandi will bring other gains. “This will help more people enter the tax system and from the increased income the government earns, maybe we will get incentives/benefits and better development,” said Patkar. While 58% of respondents, as we said, continued to support the prime minister, nearly 21% refused to comment on the political party they now support. The rest (21%) said they did not vote or did not care for elections. "Everyone in our village supports Modi despite #Notebandi difficulty. Just wish PM would pay more attention to the poor-not only farmers." Great article! Deep insights into the plight of unorganised retailers, post demonetisation. Let’s see how long they remain Modi’s ‘mitron’.